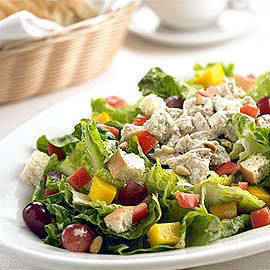 Get Italianni’s Sicilian Salad for only P6, Greenwich Big Time lunch meals for P99 + more! 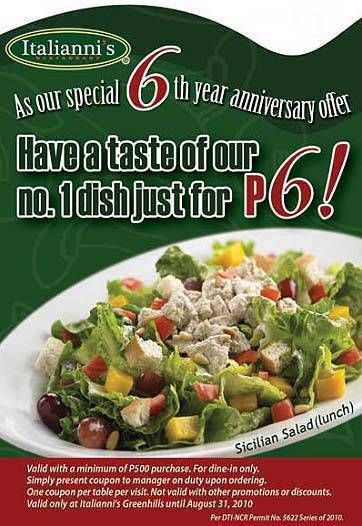 Italianni’s Greenhills is celebrating its 6th year anniversary and for a minimum purchase of P500, enjoy a serving of the Sicilian Salad for only P6. 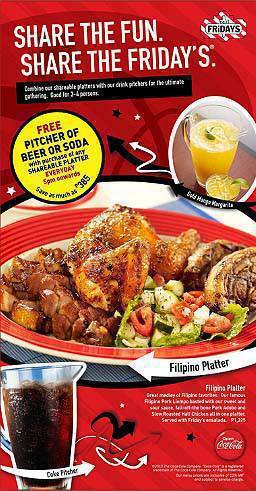 Promo is available until August 31, Tuesday at the Greenhills branch, for dine-in customers only. One redemption per table and not valid with other promotions and discounts. 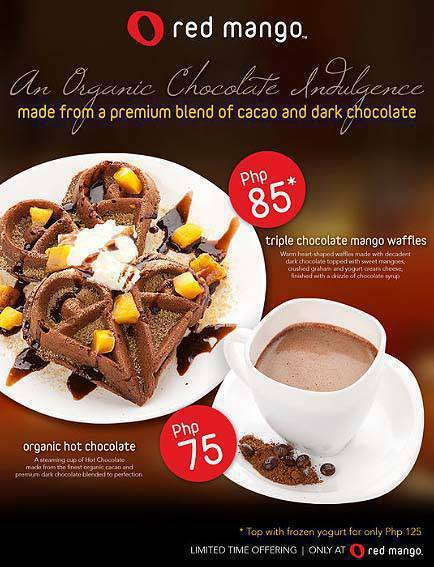 Enjoy Red Mango’s sweet offerings: Organic Hot Chocolate (P75) and the Triple Chocolate Mango Waffles (P85), made from a premium blend of cacao and dark chocolate. 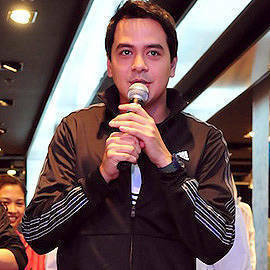 Available at Red Mango branches: Eastwood Mall, TriNoma Mall, SM Megamall, Greenbelt 3, and SM Mall of Asia. A big appetite calls for a super-sized meal. Head to Greenwich for their Big Time lunch meals: spaghetti, chicken and rice for P99; spaghetti, chicken, and a slice of Hawaiian pizza for P119; Lasagna, a slice of Hawaiian pizza and pizza fries for P149; or spaghetti, a solo Hawaiian pizza, chicken and rice for P149. All meals come with a glass of softdrinks. Available at all Greenwich branches. Get affordable eats at Masas with their "Busog Ka" Meals starting at P125. Choices include chicken inasal, fish fillet, kare-kare, served with rice and soup with laing on the side. Masas is at the Ground Floor, Greenbelt 2, Ayala Center, Makati City. Tel. No. 757-4031. 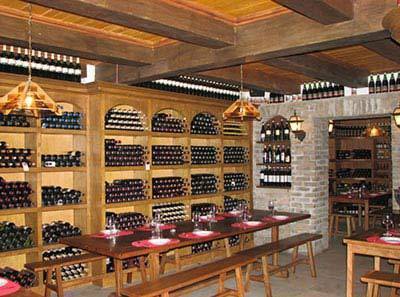 For a minimum of five in a group, enjoy Galileo Enoteca’s seat meals at P350 per person. The menu includes soup of the day, chicken strip salad, one pizza, pizza choices of pasta and iced tea for the group. Promo is available daily, from 12 noon to 5 p.m.
Galileo Enoteca is at 80 Calbayog corner Malinao Streets, Mandaluyong (532-0482 and 534-4633). Pair your tapas with free-flowing wine at Lolo Dad’s Brasserie’s Happy Hour from 5 p.m. to 8 p.m. for only P920+. 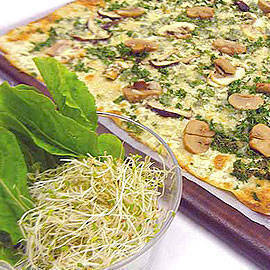 Lolo Dad’s Brasserie is at G/F 6750 Ayala Ave., Makati City. Tel. No. 813-6750. Enjoy a delectable lunch feast at Makati Shangri-la’s Shang Palace with an all-you-can-eat spread of dim sum specialties accompanied by soup, rice, noodles, dessert, plus your choice of main course to satisfy the biggest of appetites for only P999+. 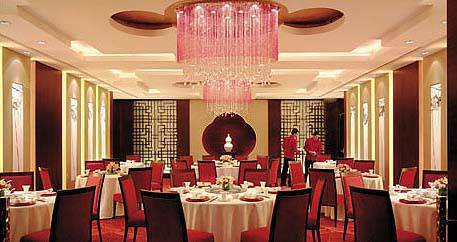 Promo is valid from Mondays to Saturdays from 11:30 a.m. to 2:30 p.m.
Shang Palace is at the 2/F Makati Shangri-la Hotel, Ayala Center, Makati City. Tel. Nos. 840-0884. From 9 p.m. to 2 a.m., get fifty percent off on all cocktails at La Regalade. If you are a group of 6, get one pitcher of a cocktail drink for free! 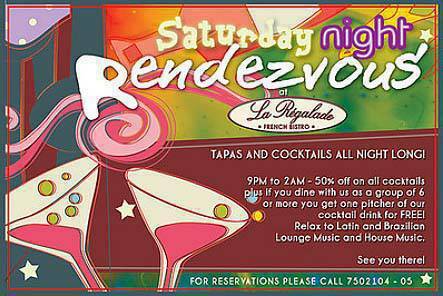 La Regalade is at 820 Arnaiz Avenue (Pasay Road), Makati City. Tel. No. 750-2104, 750-2105. Order the Filipino Platter and enjoy a medley of Pork Liempo, fall-off-the-bone Pork Adobo and Slow Roasted Half Chicken served with Friday’s ensalada, good for three to four persons and get a free pitcher of beer or soda. Promo is valid daily from 5 p.m. onwards at all T.G.I. Friday’s branches. 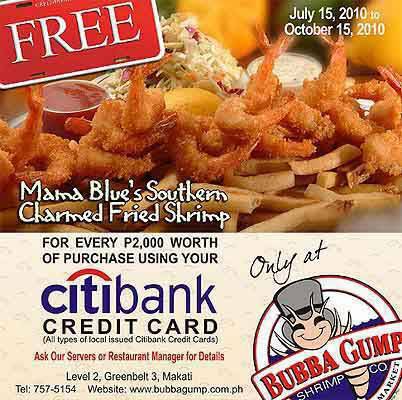 Every receipt worth P2,000 of Bubba Gump food purchases gets you a FREE serving of Mama Blue’s Southern Charmed Fried Shrimp. Promo is valid until October 15, 2010 at the Glorietta branch until October 15, 2010.